A dress of very fine jacconot muslin, with one broad flounce, embroidered in a rich and splendid pattern. The body plain, and made exactly to fit the shape, but encircled round the upper part of the bust by a broad falling tucker of fine lace, or of muslin, beautifully embroidered, to answer the flounce on the border of the skirt. The sleeves are long, and confined at the wrists by gold jointed bracelets; the different partitions of which are in points, finely wrought, and finished in the most masterly style. The hair is arranged in full clustered curls and bows, among which are mingled puffs of pink gauze with those of canary-yellow. From the puffs depend long lappets, one of pink, the other of canary-yellow, each terminated by two rich tassels of silk. A belt of canary-yellow satin encircles the waist, and is fastened in front with a square gold buckle. The ear-rings worn with this dress are of wrought gold, and the necklace is formed of two rows of large pearls. 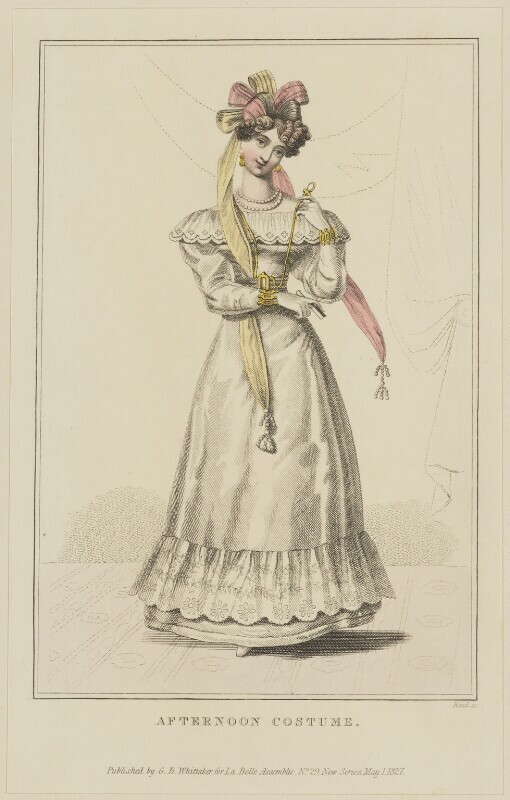 We have seen a dress similar in fashion to that above described, for an evening party; but then the dress was of tulle over white satin, and the flounce was of blond; the body of white satin; the sleeves short, and the tassels on the lappets were formed of pearls. The whole style, however, is better adapted, according to our first description, for receiving afternoon parties at home.